Take a critical look and evaluate the feeding and production strategies employed at your farm to see if they are still the best way to achieve your income goals. The first step is to determine the nutrient needs of each group of livestock and in total. Next is to estimate the amount of home grown nutrients available toward meeting that need. Most farms in the region already rely on purchasing some nutrients in the form of grain for their livestock and are likely to need to increase those purchases. If you find you will be short of feed with your present strategy, there are a number of alternatives to consider for bringing your feed and livestock into balance. Increase the proportion of grain to forage in the ration. This is most viable when grain prices are low relative to forage and you have plenty of forage in the ration already. With this alternative, it is important to be certain you are meeting the fiber requirements of the cow. Purchase forage from a neighbor or outside the region. When purchasing forage, quality is a very important consideration. Know what you are getting from a quality perspective. A nutrient dense feed may come with a hefty price tag but it may be less costly per pound of nutrients than a less expensive feed harvested past its prime. Your network is important now. Keep in touch with others in the industry to learn who might have extra feed they are willing to sell either from their storage or standing in the field. With low grain prices, grain producers might be willing to sell their corn to you for forage rather than combining it. Planting a winter annual grains for forage and harvesting it in the early spring can be employed to boost early spring forage yields. Adequate soil moisture for germination this fall and timely establishment will maximize yields early next spring to help bring your forage inventory back in balance with herd demands. For grazers, keeping watch of your pasture and tightening up the grazing interval as you reintroduce cattle to the pastures once grass starts growing again will give more time for recovery and strengthening of the pasture plants going into the coming winter. An application of nitrogen as pastures green up again will help stimulate fall regrowth and lengthen your grazing season once moisture levels increase. If you are forced to graze tight in the fall you will need to plan for slower starting pastures in the spring. Consider boarding youngstock with someone who has adequate forage. You might need to look outside the local area to find a heifer grower who has the feed enough to accommodate your heifers. Culling the herd heavily may be necessary if inventories are critically low and additional quality forage is not available. To maximize forage savings, make and execute culling decisions sooner rather than later to minimize the number of livestock you need to liquidate to stay within the confines of your forage inventory. Remember, the younger animals are, the less impact culling them will have on conserving forage. You also want to be certain you have replacements in the pipeline to bring the milking string back to full force once your forage inventories are stabilized Establish criteria for aggressive culling and monitor livestock and forage inventories frequently to be certain you have enough feed to carry your herd through to the next harvest season. Our colleagues across the state have developed a couple of resources to help with culling criteria. 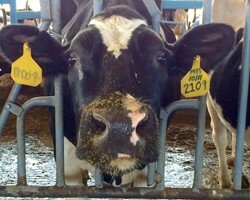 The first is an article by Ron Kuck that discusses management options for different groups of livestock: https://s3.amazonaws.com/assets.cce.cornell.edu/attachments/17085/Dairy_Cattle_Management_Strategies_and_Opportunities_in_a_Drought.pdf?1470667611. Taking a pro-active approach will help you position your livestock enterprise to thrive after the drought. Managing feed inventories and livestock numbers is a delicate dance but the effort you put into it will pay dividends in added returns for your business.